City of Russian Poland, in the government of the same name; situated 60 miles southeast of Warsaw; in importance the third city of Poland. Numbers of Jews were living in Lublin in the fourteenth century. They were not allowed to dwell in the city proper, but were restricted to the suburb of Kazimierz on the Bystrzyc, a tributary of the Wierprz. This suburb was named after Casimir III., by whose order it was assigned to the Jews in 1396. Later it became known as the "Piaski Zydowskie" (Jewish Strand). The Jews were allowed gradually to occupy a district within the city until the accession to the Polish throne of Sigismund II. (1518), who confined the settlement of the Jews to their original quarter. In the following year the king imposed upon them a special tax called "Striegeld," and, to please their competitors, the Christian merchants, restrained their commercial enterprises. The manufacture of beer, which was at that time exclusively in the hands of the Jews, was now restricted by the king to those who had acquired real property in the city. In 1552 he prohibited the Jews from dealing in food. From the middle of the sixteenth to the middle of the eighteenth century Lublin was a great center of Jewish activity and the principal place of meeting of the Council of Four Lands. At the end of the sixteenth century the Jews, in consideration of the payment of special taxes, were permitted to reside in the Podzance quarter of Lublin. The government record of licenses (part xxxvi., No. 14) of the year 1596 shows that there were then 100 Jewish houses in Podzance, and that the annual tax was fixed at 80 florins and 27 grivins. Sigismund August increased the tax on houses to 250 fl. Besides taxing the tenants of the houses 70 fl., he imposed the following additional taxes: for 16 butcher-shops, 53 fl. 6 gr. ; for 20 hot-bath tubs, 80 fl. ; for a bath-house and a liquor-shop at Podzance, 200 fl. The number of Jews in the city at that time may therefore be estimated at about 2,000. Their numbers steadily increased, and in 1630 the annual tax paid by them amounted to 300 Polish guilders. Ladislaus IV. confirmed (March 21, 1633) the privileges granted to the Jews by former kings of Poland. Immediately prior to the Cossacks' Uprising in 1648 the Jesuits instigated a riot and attacked the Jewish quarter. Twenty houses were ransacked, eight Jews being killed and twenty wounded. The Jesuits were prosecuted before Ladislaus IV. and were severely punished. Later (1650) the Jesuits established in Lublin a printing-press which existed till 1670. They published many works hostile to the Jews, thus creating enmity between the latter and the Christian inhabitants. To the influence of the Jesuits is attributed also the decree of 1650, forbidding Jewish apothecaries to prepare medicine, and that of 1654, prohibiting performances by Jewish musicians not having a special permit from the government. The Jewish population of Lublin in 1656 was about 2,000 families, and, including those who for safety fled from the neighboring villages, there must have been in the city at least 10,000 Jews, most of whom were massacred by the Cossacks. Among the martyrs were many prominent rabbis and scholars. Some entered the cemetery and, after engraving their names upon the wall, arranged to be buried alive rather than fall into the hands of the mob and be tortured. Rabbi Samuel b. David, in his "Ḥesed Shemuel" (ed. Amsterdam, 1699, pp. 2b, 43b), assigns the occurrence to the day preceding the Sukkot festival of 5417 (= Oct. 15, 1656), and describes his own miraculous escape (see Cossacks' Uprising). Under the city magistrate Jan Carl Danielowicz the Jews of Lublin fared better than they had done at any previous time. In his charter of Nov. 21, 1675, concerning the rights of the Jews, Danielowicz reviews the privileges granted by the former Polish kings, which he declares to be a safeguard to Jewish life and property. 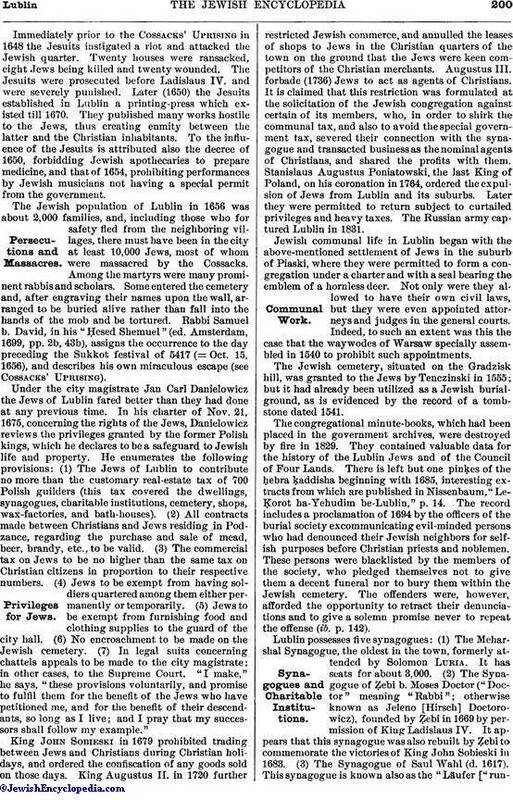 He enumerates the following provisions: (1) The Jews of Lublin to contribute no more than the customary real-estate tax of 700 Polish guilders (this tax covered the dwellings, synagogues, charitable institutions, cemetery, shops, wax-factories, and bath-houses). (2) All contracts made between Christians and Jews residing in Podzance, regarding the purchase and sale of mead, beer, brandy, etc., to be valid. (3) The commercial tax on Jews to be no higher than the same tax on Christian citizens in proportion to their respective numbers. (4) Jews to be exempt from having soldiers quartered among them either permanently or temporarily. (5) Jews to be exempt from furnishing food and clothing supplies to the guard of the city hall. (6) No encroachment to be made on the Jewish cemetery. (7) In legal suits concerning chattels appeals to be made to the city magistrate; in other cases, to the Supreme Court. "I make," he says, "these provisions voluntarily, and promise to fulfil them for the benefit of the Jews who have petitioned me, and for the benefit of their descendants, so long as I live; and I pray that my successors shall follow my example." King John Sobieski in 1679 prohibited trading between Jews and Christians during Christian holidays, and ordered the confiscation of any goods sold on those days. King Augustus II. in 1720 further restricted Jewish commerce, and annulled the leases of shops to Jews in the Christian quarters of the town on the ground that the Jews were keen competitors of the Christian merchants. Augustus III. forbade (1736) Jews to act as agents of Christians. It is claimed that this restriction was formulated at the solicitation of the Jewish congregation against certain of its members, who, in order to shirk the communal tax, and also to avoid the special government tax, severed their connection with the synagogue and transacted business as the nominal agents of Christians, and shared the profits with them. Stanislaus Augustus Poniatowski, the last King of Poland, on his coronation in 1764, ordered the expulsion of Jews from Lublin and its suburbs. Later they were permitted to return subject to curtailed privileges and heavy taxes. The Russian army captured Lublin in 1831. Jewish communal life in Lublin began with the above-mentioned settlement of Jews in the suburb of Piaski, where they were permitted to form a congregation under a charter and with a seal bearing the emblem of a hornless deer. Not only were they allowed to have their own civil laws, but they were even appointed attorneys and judges in the general courts. Indeed, to such an extent was this the case that the waywodes of Warsaw specially assembled in 1540 to prohibit such appointments. The Jewish cemetery, situated on the Gradzisk hill, was granted to the Jews by Tenczinski in 1555; but it had already been utilized as a Jewish burial-ground, as is evidenced by the record of a tombstone dated 1541. The congregational minute-books, which had been placed in the government archives, were destroyed by fire in 1829. They contained valuable data for the history of the Lublin Jews and of the Council of Four Lands. There is left but one pinḳes of the ḥebra ḳaddisha beginning with 1685, interesting extracts from which are published in Nissenbaum, "LeḲorot ha-Yehudim be-Lublin," p. 14. The record includes a proclamation of 1694 by the officers of the burial society excommunicating evil-minded persons who had denounced their Jewish neighbors for selfish purposes before Christian priests and noblemen. These persons were blacklisted by the members of the society, who pledged themselves not to give them a decent funeral nor to bury them within the Jewish cemetery. The offenders were, however, afforded the opportunity to retract their denunciations and to give a solemn promise never to repeat the offense (ib. p. 142). Lublin possesses five synagogues: (1) The Meharshal Synagogue, the oldest in the town, formerly attended by Solomon Luria. It has seats for about 3,000. (2) The Synagogue of Ẓebi b. Moses Doctor ("Doctor" meaning "Rabbi"; otherwise known as Jeleno [Hirsch] Doctorowicz), founded by Ẓebi in 1669 by permission of King Ladislaus IV. It appears that this synagogue was also rebuilt by Ẓebi to commemorate the victories of King John Sobieski in 1683. (3) The Synagogue of Saul Wahl (d. 1617). This synagogue is known also as the "Läufer ["runners"]Synagogue," because it was formerly used by visitors and strangers. (4) The Ḳahal Synagogue, often visited by Samuel Edels (d. 1631). (5) The Parnes Synagogue, founded by Abraham Parnes (d. 1763). There are also a "Tailors' Synagogue" and several others of recent date. Among the charitable and educational institutions are: the Jewish hospital, housed in a modern building, with 56 beds; an asylum for the aged, for widows, and for orphans; a Hebrew free school (Talmud Torah); and a Jewish school, in which the teaching of Hebrew and of secular knowledge is combined under Jewish and non-Jewish masters. On the yeshibot founded by various rabbis see Jacob Pollak; Shalom Shachna; Solomon Luria; Meïr ben Gedaliah Lublin. The government census of 1896 gave the total population as 48,758, of whom 23,788 were Jews. 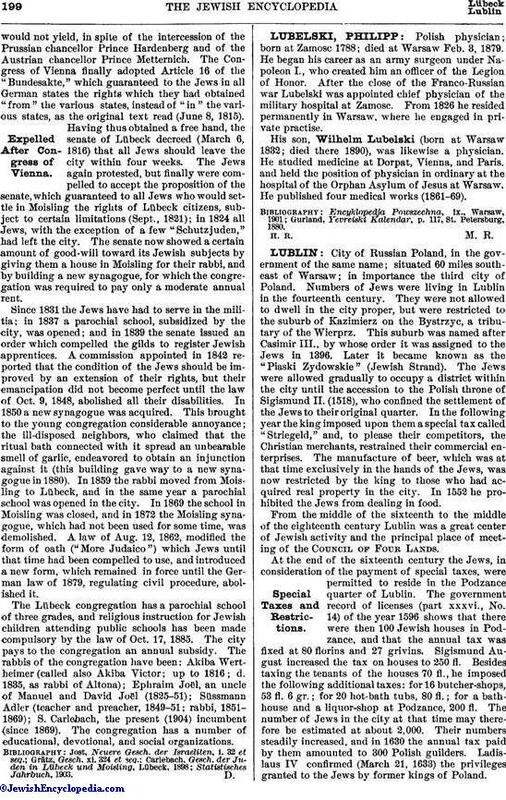 In 1899 the total Jewish population of the government of Lublin was 186,787. Lublin is an industrial and manufacturing town, containing 3 distilleries, 3 breweries, 4 tanneries, 6 brick-factories, 4 soap-and-candle factories, 3 tobacco-factories, 2 implement-factories, and 1 flour-mill; also factories of yarn and of linen and hemp goods. The Jews control most of these, and nearly all the mercantile and banking business. Bershadski, in Voskhod, Oct., 1895. 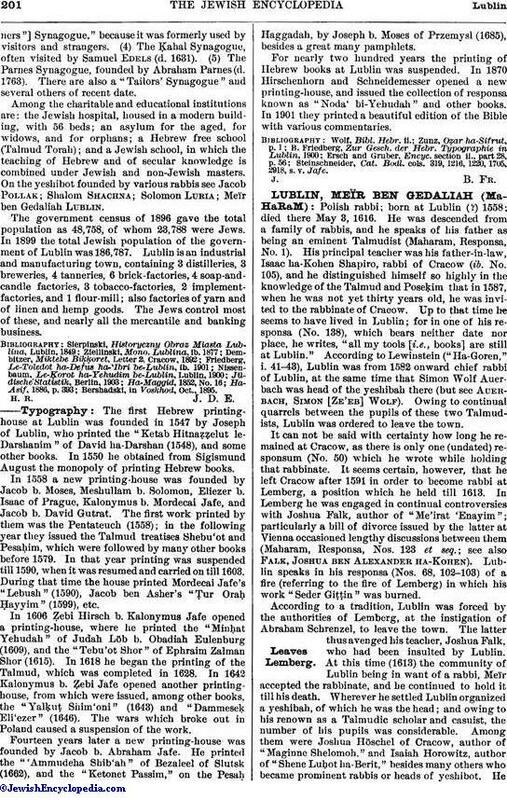 The first Hebrew printing-house at Lublin was founded in 1547 by Joseph of Lublin, who printed the "Ketab Hitnaẓẓelut le-Darshanim" of David ha-Darshan (1548), and some other books. In 1550 he obtained from Sigismund August the monopoly of printing Hebrew books. In 1558 a new printing-house was founded by Jacob b. Moses, Meshullam b. Solomon, Eliezer b. Isaac of Prague, Kalonymus b. Mordecai Jafe, and Jacob b. David Gutrat. The first work printed by them was the Pentateuch (1558); in the following year they issued the Talmud treatises Shebu'ot and Pesaḥim, which were followed by many other books before 1579. In that year printing was suspended till 1590, when it was resumed and carried on till 1603. During that time the house printed Mordecai Jafe's "Lebush" (1590), Jacob ben Asher's "Ṭur Oraḥ Ḥayyim" (1599), etc. In 1606 Ẓebi Hirsch b. Kalonymus Jafe opened a printing-house, where he printed the "Minḥat Yehudah" of Judah Löb b. Obadiah Eulenburg (1609), and the "Tebu'ot Shor" of Ephraim Zalman Shor (1615). In 1618 he began the printing of the Talmud, which was completed in 1628. In 1642 Kalonymus b. Ẓebi Jafe opened another printing-house, from which were issued, among other books, the "Yalḳuṭ Shim'oni" (1643) and "Dammeseḳ Eli'ezer" (1646). The wars which broke out in Poland caused a suspension of the work. Fourteen years later a new printing-house was founded by Jacob b. Abraham Jafe. He printed the "'Ammudeha Shib'ah" of Bezaleel of Slutsk (1662), and the "Ketonet Passim," on the Pesaḥ Haggadah, by Joseph b. Moses of Przemysl (1685), besides a great many pamphlets. For nearly two hundred years the printing of Hebrew books at Lublin was suspended. In 1870 Hirschenhorn and Schneidemesser opened a new printing-house, and issued the collection of responsa known as "Noda' bi-Yehudah" and other books. In 1901 they printed a beautiful edition of the Bible with various commentaries. Steinschneider, Cat. Bodl. cols. 319, 1216, 1220, 1705, 2918, s. v. Jafe.